How well do brief cognitive assessments do at detecting dementia? Populations around the globe are aging at an astounding rate. Dementia, which primarily affects the elderly, and progressively impairs individuals’ abilities to think and perform everyday activities, is therefore also on the rise. 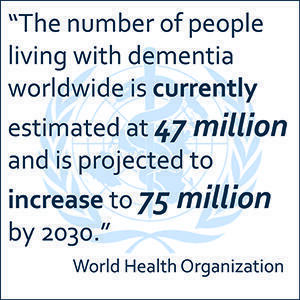 According to the WHO, “[t]he number of people living with dementia worldwide is currently estimated at 47 million and is projected to increase to 75 million by 2030.” Dementia imposes a high cost on both the individuals and families affected as well as on society in general. In recent years, increased research interest has focused on dementia due to its rising toll. Researchers are interested in establishing quicker and more accurate diagnostic instruments for the primary care setting, and brief cognitive assessments also have high value for large studies of older adults. However, the brief cognitive assessments used for dementia classification are not perfect, yielding both false positives and false negatives which may impact care in clinical settings and findings in research settings. In their recent article in Neurology: Clinical Practice, SRC researcher Kenneth Langa and co-authors analyze data from the population-based US Aging, Demographics and Memory Study (ADAMS) to determine predictors of dementia misclassification across three brief cognitive assessments. They examine clinical diagnoses from ADAMs as well as the implied diagnoses using the brief assessments, the Mini-Mental State Examination (MMSE), Memory Impairment Screen (MIS) and animal naming (AN). All three brief assessments correctly diagnosed most individuals as having normal cognitive function or having dementia. However, false-positive and false-negative rates varied across the tests, and misclassifications were correlated with other factors, such as whether a relative or friend said the individual had a memory problem, age, education, illiteracy, race, and nursing home residency. Whether and to what extent each factor affected misclassification differed, however, among the three tests. The researchers suggest that it could improve diagnostic accuracy to use different cutoffs on the brief cognitive assessments for individuals with different characteristics. Additionally, they point to an interesting finding that animal naming test achievement is negatively related to nursing home residency, possibly due to a tendency for lower verbal communication in residential facilities, or simply due to nursing home residents being quite ill; they recommend re-assessment after recovery. World Health Organization, 10 Facts on Dementia. Accessed on 1/28/2019. Ranson, Janice M., Elżbieta Kuźma, William Hamilton, Graciela Muniz-Terrera, Kenneth M. Langa, David J. Llewellyn. 2018. Predictors of dementia misclassification when using brief cognitive assessments. Neurology: Clinical Practice.